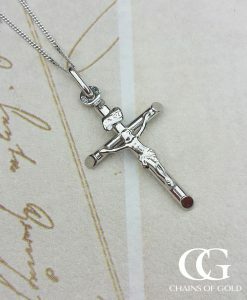 Shop for solid gold cross necklaces and crucifix pendant necklaces at Chains of Gold. Yellow gold and white gold. 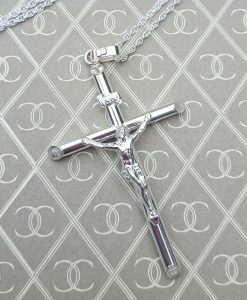 We also stock sterling silver cross and crucifix pendants. All available on selection of chain styles and lengths and suitable for men and ladies. We are an Assay Assured online jewellery shop registered with the British Jewellers Association. We offer free delivery and free 30 day returns. 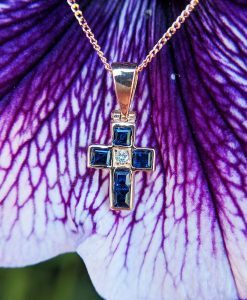 We stock a super range of devotional pendants and jewellery, including our most popular personalised solid gold cross necklace for men and women. 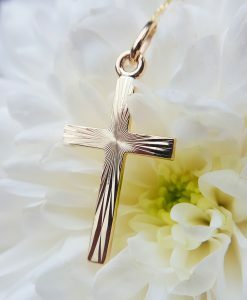 This gold cross pendant comes in two sizes and two colours: yellow gold and white gold. 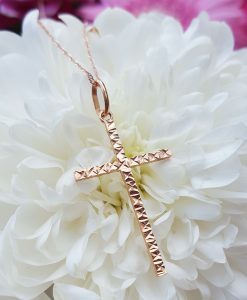 It's an Italian made gold cross, with crisp, clean edges and a good thickness and weight. 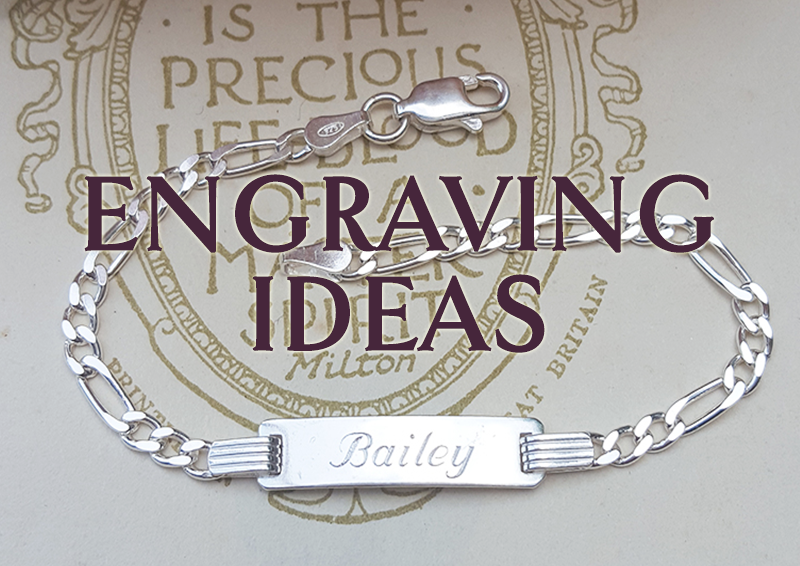 The cross has been hallmarked in the UK and we can engrave one or both sides with a name, date or small message. 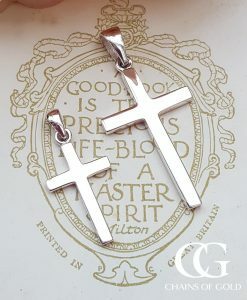 Crosses are particularly personal and meaningful pendants, and engraving your own message can add an important touch. 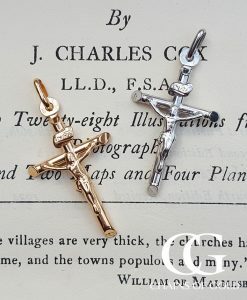 In addition to our personalised solid gold cross for men, we stock a small solid hand made gold cross. 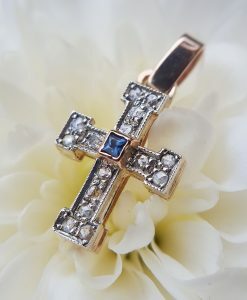 This gold cross pendant, suitable for ladies and children, is a top quality pendant made in Birmingham UK by goldsmiths with a 150 year history. 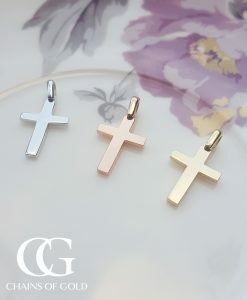 Our small gold cross comes in yellow, rose and white gold and again it can be engraved. 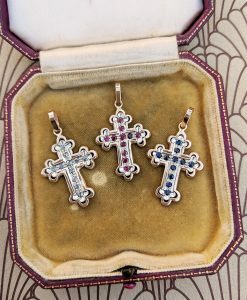 If you prefer your cross pendant a little more sparkly and eye-catching, we offer antique inspired cross pendants with diamonds , sapphire, ruby and emerald. These are super-pretty items of jewellery, on-trend yet meaningful at the same time. Made from fashionable rose gold, they compliment almost any outfit and are fab day-to-day items of jewellery. 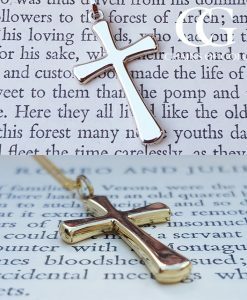 If your preference is for a silver cross necklace, we have quite few different styles available, and our personalised classic solid silver cross necklace is our best seller. 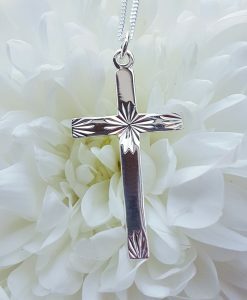 We also stock a super serenity prayer cross necklace reciting those immortal words: 'God, give me the serenity to accept the things I cannot change, Courage to change the things I can, and the Wisdom to know the difference'. Important words to live your life by, we think. Finally, we stock a large yellow gold crucifix pendant for men and a smaller yellow or white gold crucifix pendant for men and women. These pendants are popular choices for ladies and gents and are sold solo or with a selection of chain options to choose from. 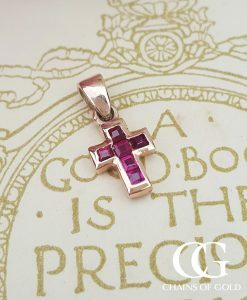 All of our cross necklaces will arrive beautifully presented in a luxury pendant box and we deliver them all over the world, free of charge. 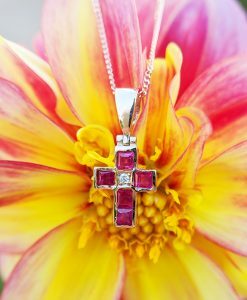 Whether you are buying your cross pendant for yourself or as a christening gift, we sell only quality items of gold and silver jewellery and we are certain you will be thrilled with your purchase.